Back in May 1985, the Paris-Dakar rally across Africa was at its high point. The factories were investing like crazy in this trans-Sahara adventure, and their marketing departments were exploiting the activity. In the forefront was Honda, trying to repeat its 1982 victory by lining up impressively large works teams of well-known riders. It was against this background that the Honda XL 600 XLM was created. More than ever, it played the card of total identification with the prestigious (though luckless) racing machines, not only from the esthetic angle big 7.4 gallon (US) tank, color scheme redolent of the works livery, twin headlamp – but also technically with square-tube chassis and swing arm, tubeless tires and a red-finished power unit benefiting from the lessons learned in competition. The 600 XLM was intended as a response to its best-selling competitor, the Yamaha 600 Ténéré, which had appeared two years earlier. Influenced by the unique appeal of its rival, the Honda offered an even more high-tech specification, particularly its radial four-valve head and complex induction system using two out-of-phase carburetors on conical intake tracts of different diameters. The XLM topped its competitor with what seemed to be a decisive advantage: an electric starter. Despite all its advantages, the XL 600 LM never made the big time. It took a twin-cylinder bike before Honda could reap the rewards of its African investment. 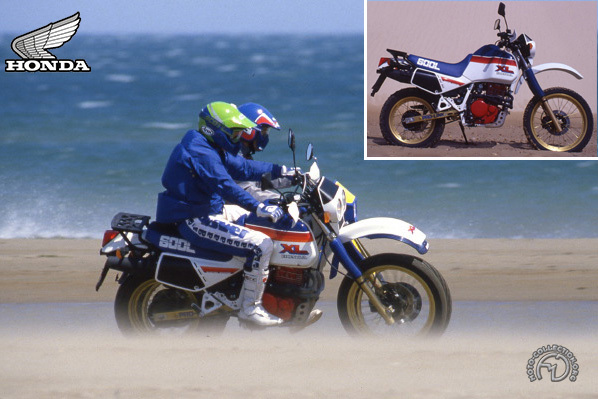 The Honda XL 600 XLM certainly looked like a Paris-Dakar competitor, but had the advantages of comfort, excellent range and styling.